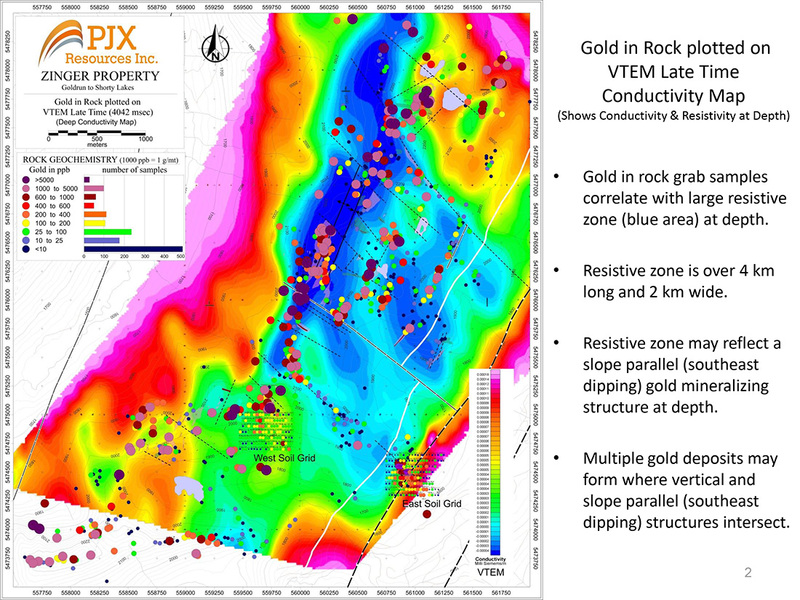 Toronto, Ontario (FSCwire) - Gold in rock grab samples associated with quartz veining can be traced for over 6 kilometres on PJX Resources’ Zinger Property. Gold values range from being anomalous to over 30 g/t. Recently announced ground geophysics has identified slope dip structures that appear to correlate with high gold values in soil, up to 4.9 g/t. We are pleased to announce that airborne VTEM geophysics has defined what management believes is a large slope dip structure at depth that expands the potential to have multiple gold deposits. Early Time VTEM conductivity data has identified areas in the rock that are more resistive (see blue areas on attached Early Time map (http://pjxresources.com/vtem-early-time.jpg)). Resistive zones in rock can be associated with areas of increased quartz veining. Gold mineralization on the Zinger Property is associated with quartz veining. The Early time map shows the geophysical signature of rocks near surface. As the map displays, gold in rock samples taken from outcrops at surface are somewhat coincident with the near surface resistive zones. This correlation can be traced along the 6 km long gold in rock trend. Late Time VTEM data shows the geophysical signature of rocks at depth. The Late Time conductivity map shows a large resistive zone at depth that is over 4 km long by 2 km wide (see blue area on attached Late Time map (http://pjxresources.com/vtem-late-time.jpg). 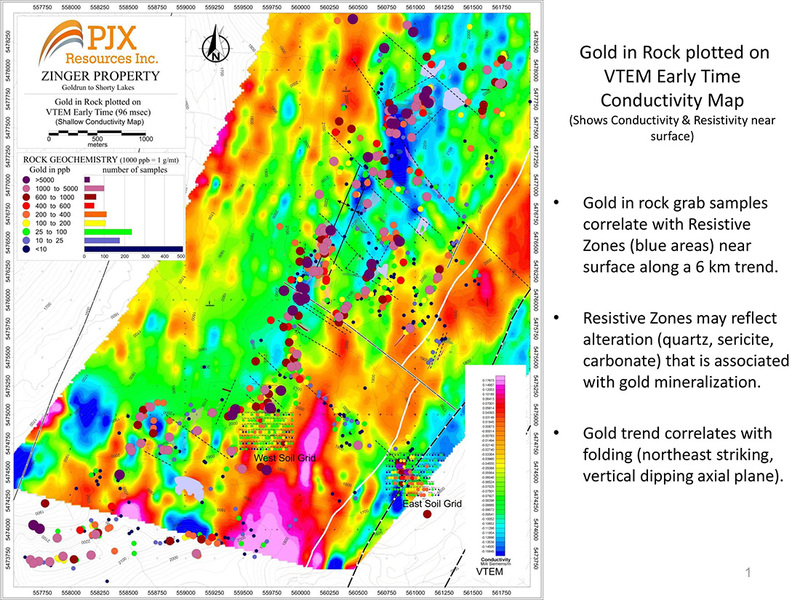 This large resistivity anomaly correlates with the 6 km long gold in rock trend as well as other gold zones found on the Zinger property. Management believes that this sizeable resistive zone represents a large slope dip structure at depth that may be an important controlling factor in the distribution and deposition of gold on the Zinger Property. Drilling continues to explore for a Sullivan type (zinc, lead, silver) massive sulphide deposit on the Vine Property. Drilling to date supports the potential for a bedded massive sulphide deposit associated with the Company’s large West Gravity anomaly, and a possible folded massive sulphide deposit associated with the large East Gravity anomaly. Some of the best sphalerite (zinc) mineralization drilled to date occurs in folded phyllitic rocks above a major regional structure called the Moyie fault. Further drilling is planned to test this folded horizon within and around the East Gravity anomaly. The foregoing geological disclosure has been reviewed by John Keating P.Geo. (qualified person for the purpose of National Instrument 43-101 Standards of Disclosure for Mineral Projects). Mr. Keating is the President, Chief Executive Officer and a Director of PJX. PJX is a mineral exploration company focused on building shareholder value and community opportunity through the exploration and development of mineral resources with a focus on gold. PJX’s primary properties are located in the historical mining area of Cranbrook and Kimberley, British Columbia. Please refer to our web site http://www.pjxresources.com for additional information. This News Release contains forward-looking statements. Forward looking statements are statements which relate to future events. Forward-looking statements include, but are not limited to, statements with respect to exploration results, the success of exploration activities, mine development prospects, completion of economic assessments, and future gold production. In some cases, you can identify forward-looking statements by terminology such as "may", "should", "expects", "plans", "anticipates", believes", "estimates", "predicts", "potential", or "continue" or the negative of these terms or other comparable terminology. These statements are only predictions and involve known and unknown risks, uncertainties and other factors that may cause our actual results, level of activity, performance or achievements to be materially different from any future results, levels of activity, performance, or achievements expressed or implied by these forward-looking-statements. Although PJX has attempted to identify important factors that could cause actual actions, events or results to differ materially from those described in forward-looking statements, there may be other factors that cause actions, events or results not to be as anticipated, estimated or intended. There can be no assurance that forward-looking statements will prove to be accurate, as actual results and future events could differ materially from those anticipated in such statements. Accordingly, readers should not place undue reliance on forward-looking statements. To follow PJX Resources Inc. on your favorite social media platform or financial websites, please click on the icons below.